It’s 1934 and the world’s most famous stage director, Max Reinhardt, is directing the film version of Shakespeare’s A Midsummer Night’s Dream when two of the characters from the play (Oberon and Puck) suddenly materialize and want to be in the show. If that sounds like a classic set-up for a Ken Ludwig Farce, you’re correct. 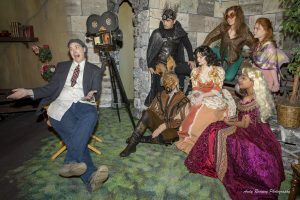 Anchorage Community Theatre is presenting Ludwig’s Shakespeare in Hollywood March 2-25 and Director Jocelyn Paine with actors Scott Rhode and ShaeLisa Anderson drop by Stage Talk this week to talk about it. ORIGINAL BROADCAST: Friday, March 2 at 2:45 p.m.